DriveSkills Motorsports is proud to present the VGT-II, the premier Virtual Motorsports GT cockpit. Developed over a two-year period, the VGT-II incorporates exclusive force-feedback steering technology and cutting edge motion dynamics, surrounded by a state-of-the-art audio-video control system, and powered by a purpose built simulation PC. Representing the pinnacle and complete design of various forms of racing, the VGT-II uses motorsport derived components, combining precision machined aluminum, composite materials, and a variety of advanced training software to provide a package that destroys the status- quo of motorsports simulation equipment. Chosen from only the best brands, each monitor is selected from scrutinized specifications to allow for premium bright- ness, contrast ratios, and the fastest of reaction times. Additionally, each monitor display is attached to a custom-built panoramic display panel, allowing for hidden wiring and cleanliness. Finally, ‘under the hood’ of the simulator graphics system lies an array of high performance video cards tuned specifically to output optimum performance. Versatility is the key word here; from Vintage racing and GT cars to Off-Road Rally and Factory Prototypes, the vehicles at your disposal are limitless. The DriveSkills VGT-II provides endless options when it comes to the selection and range of cars at the ready. NASCAR, Formula1, ALMS, Rally and Endurance, Prototype and IndyCar; all and more are available and waiting and at your disposal. Once stationed in the VGT-II, the driver is surrounded by an array of high output audio monitors and a massive subwoofer replicating engine sounds, component noise, and technical sound effects in 2.1, 5.1, or 7.1 surround sound. Additionally, all chassis are equipped with multi-dimensional vibration transducers that, together with SimVibe technology provide road and immersive feedback, making the this DriveSkills simulator equal to an audio experience of its own. 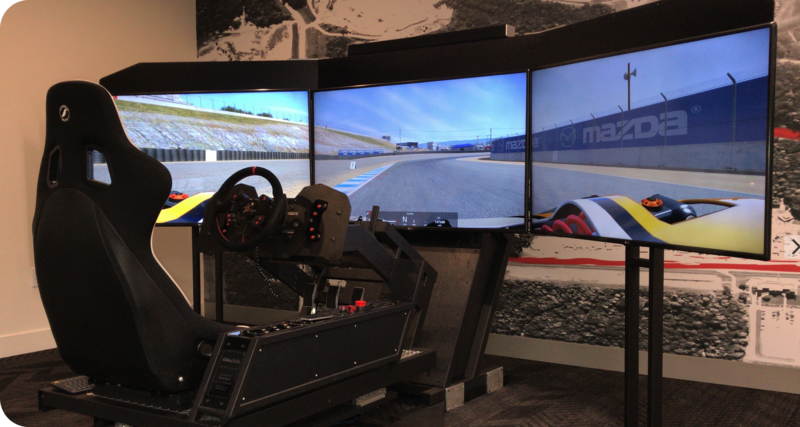 Replicating every sensation from braking and shifting, to acceleration and lateral grip, DriveSkills very own Q-Motion system induces a level of speed and realism unlike any other racing simulator through the use of electro-mechanical actuation. Using the precise sensations experienced by professional drivers and executing runs on laser mapped tracks, Q-Motion dynamics allow the user training or touring with the VGT-II to experience every sensation and perfect their driving style and abilities.